At a December 2018 meeting of the EQB, PADEP proposed to amend the fee schedule for National Pollutant Discharge Elimination System (NPDES) permit applications under 25 Pa. Code Chapter 92a. PADEP’s proposal would 1) significantly increase fees for NPDES permit applications and annual fees; 2) clarify the fees applicable to No Exposure Certifications and waivers; and 3) create a fixed date for payment of annual fees. Although PADEP modified its NPDES permit application fee schedule in 2010 (increasing amounts due in some instances), an August 2018 report to the EQB showed that the program’s revenue is still falling short of expenses. PADEP proposes to increase fees across almost every category of NPDES permits. For example, the application fee for a new, individual NPDES permit for a major facility discharging more than 5 MGD (million gallons per day) of treated sewage would increase from $5,000 to $10,000; and the fee for a new, individual industrial stormwater permit would increase from $2,000 to $5,000. Annual fees would see increases as well, often doubling the amounts currently due. 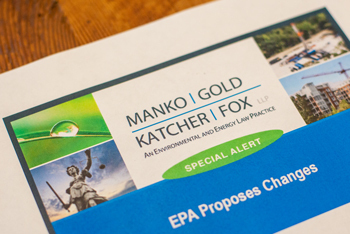 The proposed rule also would clarify that industrial facilities seeking No Exposure Certifications and municipal separate storm sewer systems (MS4s) seeking waivers must submit a formal application and pay the corresponding fee. For example, under the new rule, an MS4 seeking a waiver must submit the $5,000 fee for MS4 individual permit applications along with its application for waiver. Lastly, the proposed rule would create a fixed date for the payment of annual fees, which means that annual fees would be due on the same date each year, based on the latest issued permit’s effective date. PADEP reports that the fee increases could bring in an additional $7 million per year to the NPDES program, money which PADEP says will be used to fund new positions, such as inspectors and biologists, and in turn speed up the permitting process. The regulated community should know that PADEP recommends a 45-day public comment period, and at least one public hearing. As of this writing, however, the EQB has not yet acted on PADEP’s proposal. Therefore, there is no officially-published proposed rulemaking and no set public comment period. Stay tuned for additional updates as they become available.